Those who were injured will also be reimbursed the money they spent on medical assistance. The proposals will, however, have to be approved by Cabinet. 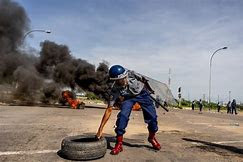 “We only provided assistance for the injured for that time.” According to the ZADHR report, 29 people in Harare were injured during the disturbances, while eight others were injured in Chitungwiza. However, it is believed that families of the deceased will be given priority. Relief will also be given to businesses, especially small enterprises, which were affected by the violence.